The neighborhood of Hatton Fields is located directly to the east of downtown Carmel-by-the-Sea. 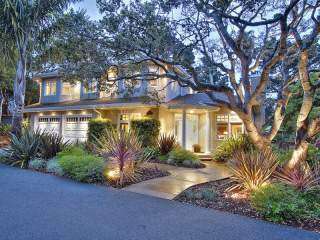 It is a sought after neighborhood with beautiful estate homes on large parcels, some with Point Lobos views. The neighborhood is bordered by Rio Road to the south, Hatton Road to the north, Hatton Canyon to the east and Junipero Street to the west. Carmel High School, Carmel Mission and Flanders Mansion are all notable landmarks in this desirable Carmel neighborhood. Flanders Mansion, a 15 room Tudor Revival mansion covered with ivy, is situated in Carmel-by-the-Sea’s largest park, the Mission Trail Nature Preserve and is one of only two properties in Carmel to be listed on the National Register of Historic Places. The park contains five trails-Flanders, Doolittle, Willow, Mesa and Serra. These trails were once used by the Padres to travel from the Carmel Mission to Monterey. The park is also home to the Lester Rowntree Native Plant Garden. The Flanders Foundation is an organization that raises funds through contributions, grants and gifts to help maintain and operate the property. There has been much debate over whether the city will sell or lease the mansion. Homes in the Hatton Fields neighborhood are part of the coveted Carmel Unified School District, making this a great location for families. Homes are nestled on spacious, landscaped lots with plenty of room for outdoor living at its best. Many estates feature a guest house on the property for out of town friends and family, or perhaps your artist’s studio or workshop. From Spanish style haciendas, stately traditional homes, to custom built homes of Carmel Stone, each home is unique and offers its own elegant style. Click here to preview all Carmel homes for sale in the Hatton Fields neighborhood. For all available Carmel real estate, click here. In 2018, 28 homes sold in this neighborhood. The most expensive home to sold for 3.6 million for a 4 bedroom, 3.5 bathroom home with 2,647 SqFt of living space on a 7,841 SqFt lot. The least expensive home that sold, was a 2 bedroom, 1.5 bathroom home with 1,073 SqFt of living space on a 9,600 SqFt lot and sold for 850K. In 2017, 25 homes sold in this neighborhood. The most expensive home sold for 3.85 million for a 3 bedroom, 3.5 bathroom home with 3,095 SqFt of living space on a 23,032 SqFt lot. The least expensive home sold for 665K for a 2 bedroom, 1 bathroom home with 935 SqFt on a 7,400 SqFt lot. In 2016, 26 homes sold. The most expensive home sold for 5.25 million for a 4 bedroom, 4 bathroom with 2,647 SqFt on an 7,841 Sqft lot. the least expensive home to sell, sold for 683,500 and was a 1 bedroom, 1 bathroom, 784 SqFt cottage on a 6,250 SqFt lot. In 2015 22 homes sold. The most expensive home sold for 4.7 million and was an Eric Miller design featuring 3 bedrooms, 3.5 bathrooms, 5,244 SqFt of living space on a 35,986 SqFt lot. The least expensive home for 650K for a 1 bedroom, 1 bathroom fixer upper on an 11,500 SqFt lot. 31 homes sold in this neighborhood in 2014. The most expensive home sold for 3.695 million for a 3 bedroom, 3.5 bathroom Chris Tescher design home with 3,788 SqFt of living space on an 15,800 SqFt lot. The least expensive home sold for 780K for a 5 bedroom, 2 bathroom fixer property with 3,684 SqFt of living space on an 34,800 SqFt lot. In 2013, 21 homes sold with the most expensive home in the neighborhood selling for 4.475 million and was a 5,189 SqFt home on a 26,800 SqFt lot and the least expensive sold for 710K and was a 1,600 SqFt home on a 9,800 SqFt lot. 21 homes sold in 2012, the most expensive home sold in Hatton Fields sold for 3.025 million and was 4,333 SqFt including a 1 bedroom, 1 bath guest house. This 4 bedrooms and 5 bathrooms and was situated on a 12,000 SqFt lot. The least expensive home sold for 480K and was a 3 bedroom, 2 bathroom home with 2,136 SqFt of living space situated on a 10,200 SqFt lot. For a detailed analysis of Carmel real estate sales, check out our monthly Community Market Reports. To live in Hatton Fields is to live the Carmel lifestyle from the peaceful surroundings of your private estate. Imagine preparing meals in your gourmet kitchen for al fresco dining on your sunny patio, majestic Point Lobos in the distance. Entertaining at home will provide an oasis for your guests as they come to visit, perhaps staying in the comfort of their own private guest house. If your Hatton Fields home faces south you will views of the Santa Lucia Mountains and Carmel Valley, a lush green backdrop that will bring you inspiration and peace of mind. If your home is situated near Ocean Avenue you will enjoy a stroll into town for coffee at a charming café, shopping in Carmel Village or a walk down to Carmel Beach, picturesque and perfect for dog walking or frolicking in the surf. Your prime location in Hatton Fields allows you quick Hwy 1 access for all the events and attractions the Monterey Peninsula has to offer.